Hi! It’s me. I did it again. I went on another trip and didn’t mention it on my blog. Instead of making more excuses for this unfortunate trend, I’m going to just dive right in to arguablely the most poignant and exciting thing about our trip to the UAE and Serbia… eating at Burger King. Okay, just kidding, there are a lot more exotic topics but this little story is funny, short and sweet and I think I can write it while the girls are at preschool today. So here it goes. 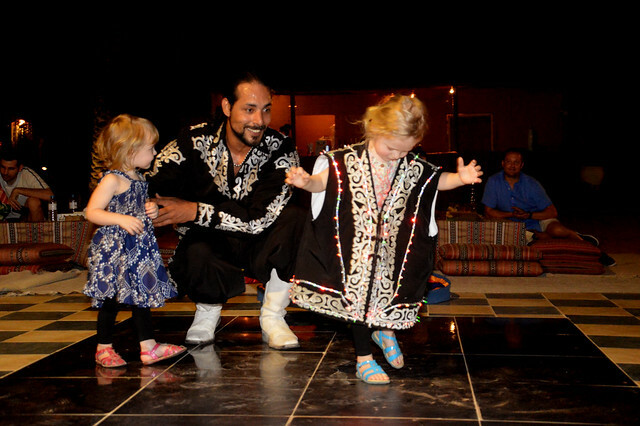 I’ll get to exciting things like Whirling Dervish posts soon. 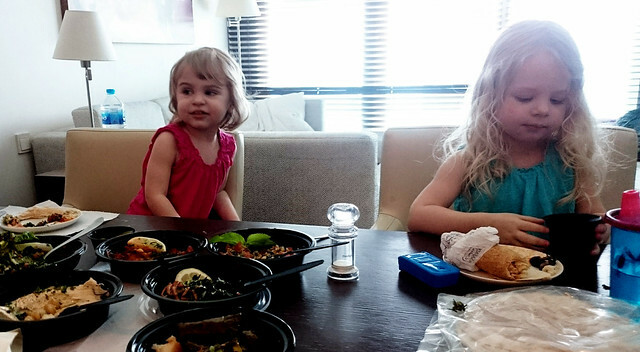 For a little backstory, before our Dubai trip I’d worked hard to prepare the girls for trying new foods when we travel. I’m fairly lucky in that my kids don’t seemed to be plagued by typical toddler food pickiness but I thought it smart to get them set for new culinary experiences regardless. We talked about new foods, watched videos about new foods and they became regulars at the neighborhood Falafel joint and even made it onto their Facebook page. So after having the concept of travel = new foods drilled into their pliable little minds, we jetted off to Dubai so they could put their dirham where their mouths are and follow through with their intrepid culinary ambitions. And follow through they did. Like here where Paige’s look of apprehension has much more to do with a fly buzzing around than with the smorgasbord of new flavors. The girls were champs. 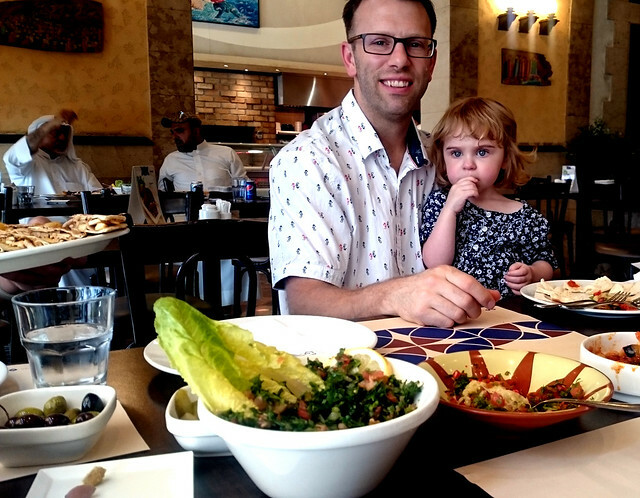 At the nearby Lebanese Restaurant they loved tabouleh, hendbeh (which is cooked dandelion), kaftah beajine and my personal favorite, shanklish. And yes, since you were no doubt wondering, I did have to virtually track down our go-to restaurant near our hotel to take a peak at their online menu to remember the names of those dishes. Here we are having take-out from that very restaurant when the mid-day sun proved to be too intense for my pale Pacific Northwest kids to leave the hotel. 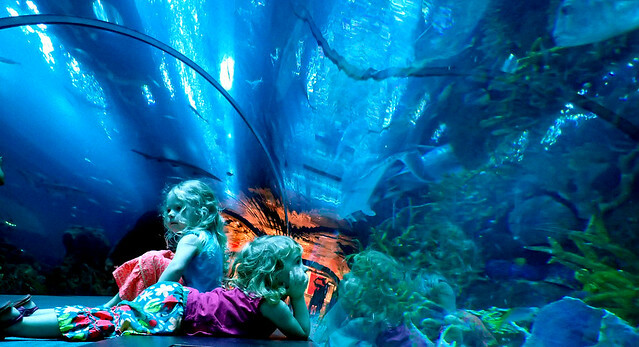 Then one evening we went to the huge Dubai Mall with its famous aquarium. The girls were so in awe of this fantastic underwater world that we simply couldn’t rush them through it… so we didn’t. But then, it was suddenly 10 PM and we hadn’t eaten dinner yet and the mall was about to close. Could you tell these pint-sized dreamers to “hurry up”? I think not. If a 10 PM dinner time sounds a little crazy, don’t worry, it wasn’t that weird. We’d undertaken quite a schedule shift to combat jet lag, time differences and the fact that the days in Dubai are screaming hot and the evenings are a lot less harsh. For a visual, here was our updated schedule. But still, malls close and kids get hungry so we rushed up to the food court and I decided that now seemed as good as time as any to introduce our kids to their first taste of fast food. First it was silent as we all sat down with our Burger King and experienced that quiet moment that occurs when people who have let themselves get a little too hungry finally have food in front of them. Paige quickly chimes in with enthusiastic agreement. And we all laugh because they’re not wrong. French fries are tasty. So they held up their end of the bargain and they did indeed try new foods in Dubai. They even got to wear super authentic crowns from the United Arab Emirates. You know the kind, they’re made out of gold paper and have the Burger King emblem on them… very authentic stuff. 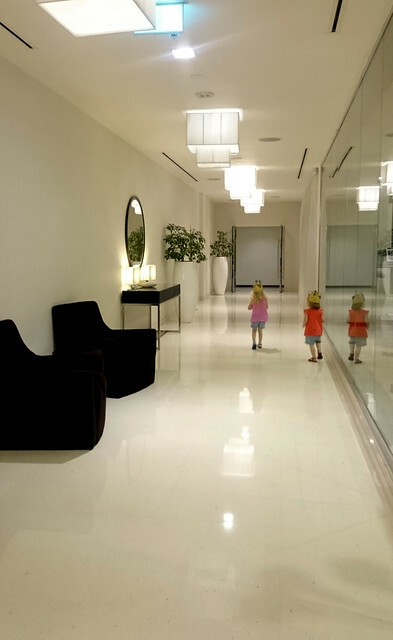 Here they are running back through the hotel hallway that night sporting their new royal headpieces. And that is my short little story of how the girls tried new foods in Dubai and loved it. But jokes aside, they did love other food we ate there too… which is more than I can say for some of the new foods we tried last fall in Malta. Prickly pear is a no go for Millie. Enjoy the clip below and I’ll be back soon with more posts!